Have you ever take a long time to watch a Symbol when the network link is not good ? Have you ever wait for a long time when you switch chart between different Symbols or different TimeFrames ? If you do long-term backtesting , Have you ever to be downloaded datas for a long time ? Yes, If there is no data in the system, those will happen. 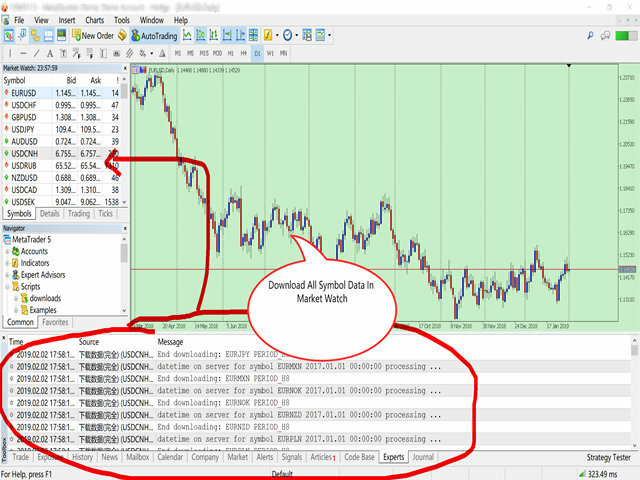 Download all the Symbol data in Market Watch to the system. PS: This is not outputting data to Files. This is Demo version. You can not choose All TimeFrames, just Default TimeFrames. You can not one-click to download All Symbol, just input yours. Downloading historical data to the system in advance can improve work efficiency. bool_usualtimeframe=true; //---Whether to choose usual timeframe of MT5. PS:If the time_Start you enter is earlier than the server time, the program will select the server time. When you download too many symbols, If your memory is not big enough, I don't recommend you to reduce sleeptime.